There are two kinds of people: Those who love bananas and those who abhor them. I take it you’re with me on team banana if you’ve gotten this far. Or maybe the “double” banana has just made you curious. Well, a banana split needs ice cream, and the fact is that frozen bananas make crazy ice-creamy ice cream. Real truth. Plus, if your banana split has little or no added sugar, or dairy for that matter, you have yourself a healthy vegan dessert that won’t hurt waistlines or lactose-intolerant tummies. Bonus: plenty of potassium and dietary fiber + no fat. 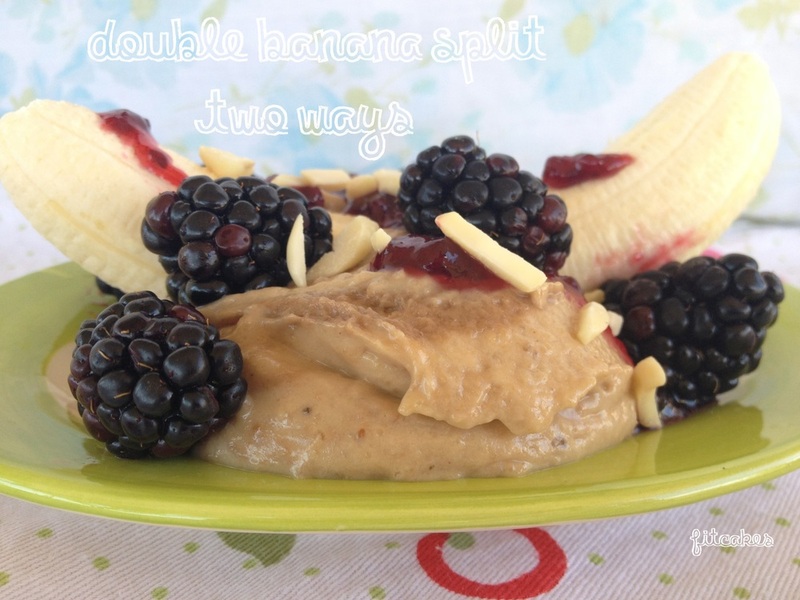 So… I’m thinkin’ maybe we should take this double banana thing and give it a whirl? Blend the frozen banana with the peanut butter in a food processor until smooth. I tried this in a blender and, yeah, the banana doesn’t really like being tossed around by the little blade like that. I had to keep pushing it down, and it took for.ev.er. So, unless you have a special blender that can handle a banana without extra liquid… food processor! 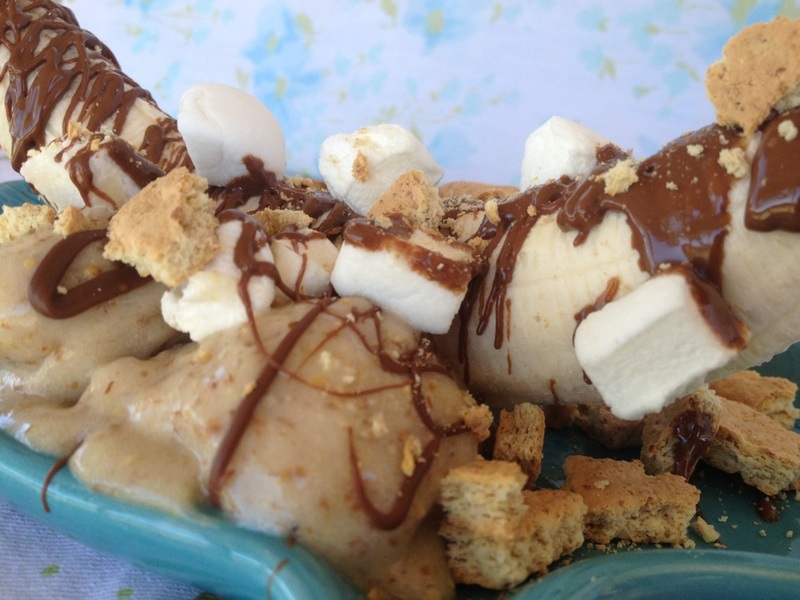 In no time, you have creamy PB banana ice cream! Scoop this out into a little bowl, cover, and place in the freezer for about 30-40 minutes until it firms up a bit, when you can use an ice cream scoop to shape it into perfect little scoops. You may have an idea of what to do next… but imma tell you anyway. It’s what I’m here for. Place the banana in the center of a banana split bowl or plate and scoop the banana peanut butter ice cream around the sides. 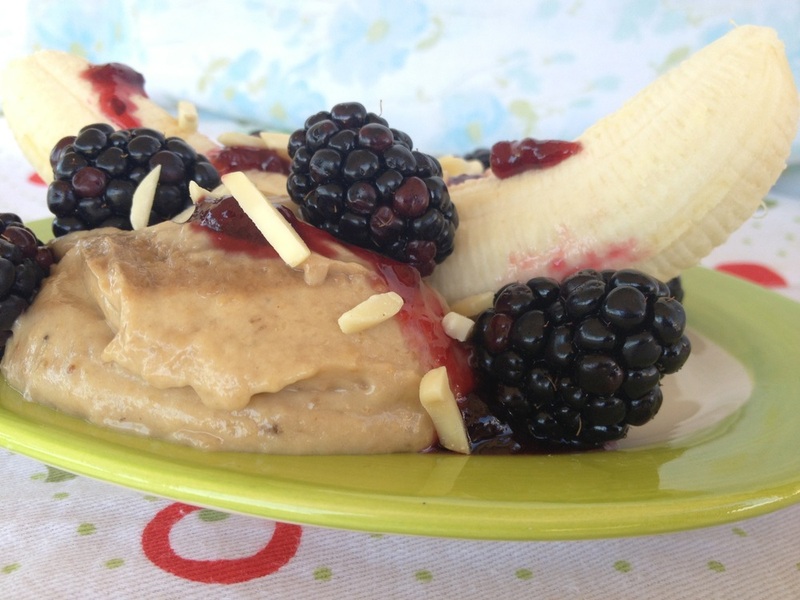 Drizzle blackberry jam lightly over the banana, and place blackberries around the split. Sprinkle on chopped almonds. Something to try – I had more peanut butter banana ice cream than I ended up needing, so I froze some of it in a silicone ice cube tray to use in future smoothies! Being firmly pro-banana myself, this S’mores Split adds exactly what I think the original S’more could use. This is also a lot like the way I make hot banana boats in tin foil around a campfire on a chilly night… except this one is cold, and therefore perfect for a hot summer night! Adding flaxseed to the banana ice cream makes it extra heart + body healthy, and even adds a slight graham-crackery flavor to it. Dark chocolate has your antioxidants, and banana…. Well, we already went over that, right? Just more reasons to gobble up S’mores Splits, yes? Blend the frozen banana with the flaxseed in a food processor until smooth. Chill the banana puree, covered, in the freezer in a small bowl for 30-40 minutes, until firmed up and ready for scooping. 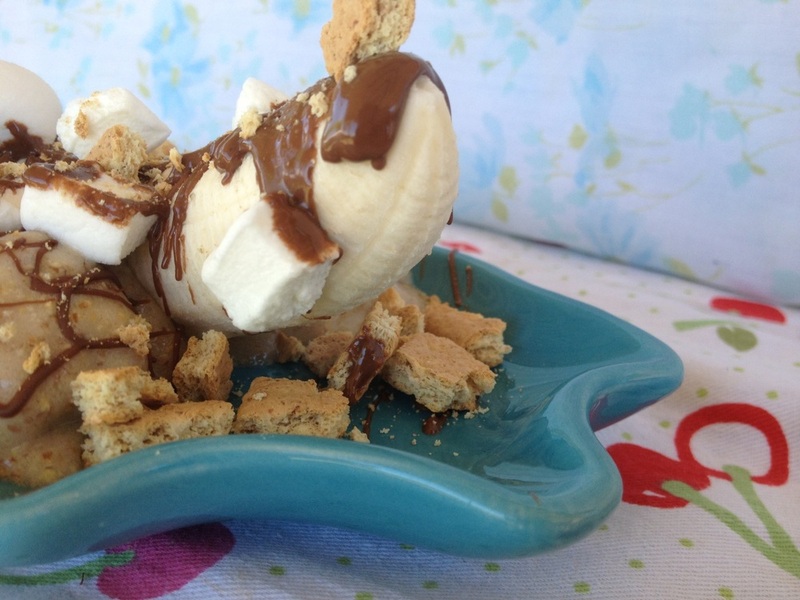 Place the banana in the center of a banana split bowl or plate and scoop the banana ice cream around the sides. 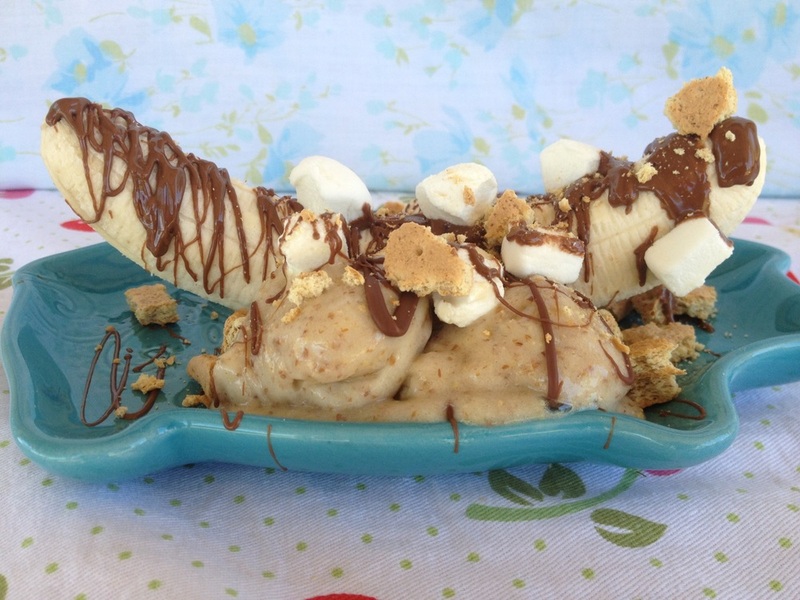 Using a fork, dip into the melted chocolate and then drizzle it over the banana. Top with graham cracker crumbles and mini marshmallows!